Touch it once and be enchanted for ever. Not all woods are alike. An APUS® is more than just a piece of furniture. APUS® is 100% natural. You can feel it. You can see it. And when you listen to your inner voice, then you know: Feeling good has a name. Honest material. Functionality and homeliness. Aesthetics and design. 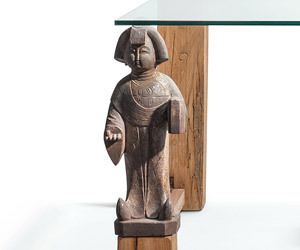 APUS® Tables made of centuries-old, Chinese timbers are completely untreated and natural. They are as stylish and homely as they are robust and long-lasting: APUS® - the table for sophisticated users - at home, in the office or in the hotel and catering trade. APUS® defines a new generation of tables – whose quality is unique. Wood is life. APUS® is an expression of your personality. You give free rein to your dreams – and we create your APUS®. Each APUS® is made-to-measure work. A unique product. You decide on your design, your shape, possible combination of materials and size. We design your table to meet your wishes – also with stylistic elements from your life, if you so wish. 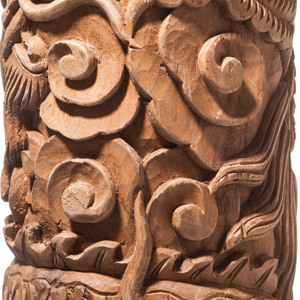 They can be carvings that pick up on symbols, signs, writing or images. Materials such as glass or metal can also feature in your personal APUS® with the valuable, centuries-old timbers from China. Another possibility is to integrate sculptures or statues in your APUS®. We are in touch with art dealers in China and can find the artwork that suits you and your table. We will be pleased to advise and assist you - from the first idea to when you place your table in your dining or work area. APUS® makes your interior design dreams come true. Please consult us. We will be pleased to advise you and submit an individual quotation. PEOPLE. NATURE. FURNITURE. NATURALLY PERSONAL. Wood is life. APUS® is an expression of your personality. We design your table to meet your wishes – also with stylistic elements from your life. MY TABLE. MY VALUES. NATURALLY STYLISH. A witness of the past. A friend of the present. A messenger of the future: a mix of materials for your personal piece of furniture. We work sculptures, statues or your favourite pieces with valuable old elm wood or mahogany from China to make your personal APUS®. SPACE FOR LIVING. SUCCEEDING. NATURAL. APUS® is classic and simple. Combine several pieces of furniture and vary individual pieces as you fancy. APUS® is diversity and flexibility - both at home and in the catering trade. Character begins at home. Your APUS® is unique. High-quality timbers from China: APUS® works mahogany and elm according to the ancient Chinese art of craftsmanship. APUS® works elm wood and mahogany from China. Naturally stylish. And long-lasting. Design meets craftsmanship. APUS® stands for the art of master craftsmanship. My table. My centre. Discover the new lifestyle with your APUS®. For people who work, design and perform official duties: an APUS® stands for competency, potential and high esteem. Lifestyle is a commitment. APUS® fulfils your wishes. Naturally. Your APUS® - Enjoy with friends and family. Whether they are round, square, long, short, plain or decorated: tables connect. Between two worlds. Succeeding at home. 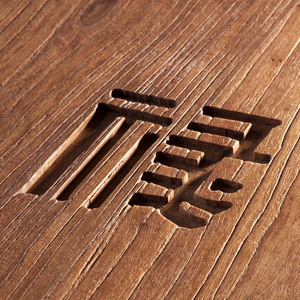 APUS® makes tables from old, Chinese timbers. Living designed by nature. APUS® links people, nature and furniture. Wood is life. And an expression of your personality. Create your APUS®. APUS® redefines lifestyle and luxury. With high-quality timbers from China. Living and feeling at ease: APUS® opens up spaces. Succeed. In your own home. APUS® is 100% natural. The timbers are completely untreated and natural. Each APUS® is a unique piece. We make to measure and to meet your personal wishes. APUS® is an expression of your personality. Design your furniture to meet your wishes. Naturally. Uniquely. Lifestyle. Living style. Natural: APUS® creates with and for you a personal world in which you feel at ease. Your APUS®. An expression of your identity. If you so wish, carvings can also be done to individual models. Living. Naturally. Uniquely. APUS® design for sophisticated customers. Good business flourishes with good connections. Modern business needs time for authenticity. Not all woods are alike. APUS® fascinates – and creates values. APUS® is 100% natural. For generations.